It looks like Samsung is well on its way with its self-imposed target to become the world's largest cell phone manufacturer by 2014. The first quarter of this year saw it sell 13.2 million phones in Europe, for the first time more than Nokia's 12.6 million units. This leaves Nokia with strongholds mainly in Asia and Africa, and it is selling a huge amount of phones there, unlikely to be overthrown soon, unless affordable Androids make a dent in its market share in those regions. Samsung's vows were, of course, set before the Nokia Windows Phone adventure was announced in February this year, which changed the horizon quite a bit. Until the first Nokia handset with the Windows Phone mobile OS ships, though, Samsung will undoubtedly push as strong and hard as it can, to gain market share, and bring itself closer to the stated goal of becoming world's number one cell phone maker. Holy Christ, look at the percentage growth on Samsung. 744 percent. If they can keep even a fraction of that up they'll be number one next year. That's just in smartphones. Look at HTC's 271% overall. i think samsung later going to remove Nokia from the first place but still not sure you don't know what Nokia hidden! Nokia and moto still has the best call quality in all smart phones around. apple only have 4 models and yet they were able to beat nokia and samsung which have a lot of models in their line-up. steve job is really a genius. Liver cancer has little to do with it. Market research, analytics, and making Foxconn employees sign no-suicide-contracts makes more money than anything respectful of human rights. Forcing workers to be exposed to carcinogenic chemicals in production for extended periods of time are better for the bottom line than environmentally responsible business practices. Why do you think GreenPeace ranked Apple and Nintendo two of the worst offenders in the world? Cost cutting is great for the final price, but not necessarily anything else. iApple jumped in to fill a gap that Nokia left WIDE open for 2 years. And 2 years in the tech world is close to a decade in the real world. Taking advantage of an opportunity was their company strategy, not the genius of one man. He's not an engineer, he doesn't write code, he doesn't know how to design on autoCAD. He's one director of many in a team. The masses are fascinated with the fantasy that one guy single-handedly constructed the most wonderful thing they're holding in there hand at that current moment. I find it so simple minded when people can actually believe that one person made every single decision in a giant company with close to 50,000 employees. Everyone always forgets about HTC: Quietly Overlooked. 271% increase is pretty damn awesome, right? Good for them. 4.3" qHD dual-core 1080p cameras unibody chassis should be the standard for everyone else, too. 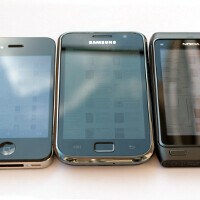 Samsung and Motorola make great flagships packaged in light, cheap, plasticy feeling housings. Even Nokia uses anodized aluminum, stainless steel, chrome, brushed aluminum, and Nokia's plastics are at least more environmentally responsible, scratch resistant (not proof), impact absorbent, and don't Feel like cheap Chinese crap plastic (even though they're probably manufactured there). What was that you said about Motorola? Have you HANDLED a Droid lately? DroidX is pretty sweet; Droid regular with the slide keyboard has a giant slab of plastic underneath the Android buttons, That's an example of what I meant about plastics. Pick up the Atrix. It's awesome internally and looks low to midrange externally. HTC does make fantastic phones. Motorola is still my personal choice. Nokia has gone down because of the old OS they use in their smartphones. If they go for android i bet samsung will be thrown out of the box by Nokia.